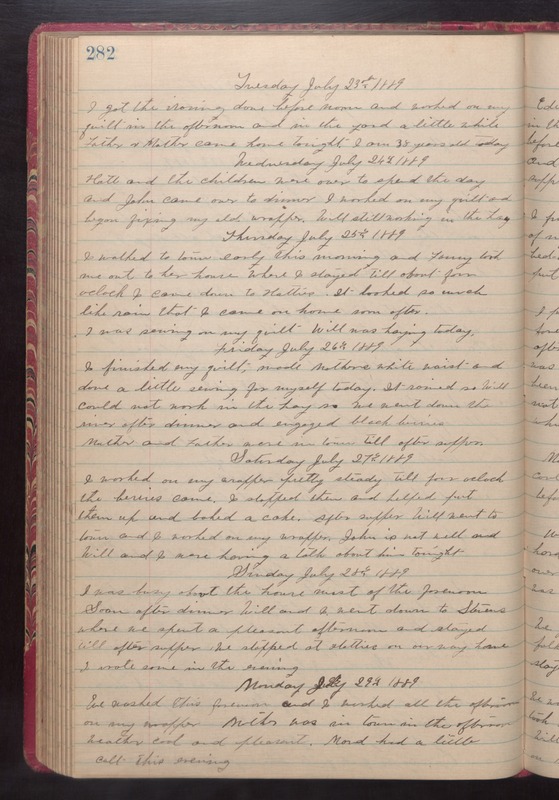 Tuesday July 23rd 1889 I got the ironing done before noon and worked on my quilt in the afternoon and in the yard a little while Father & Mother came home tonight. I am 38 years old today. Wednesday July 24th 1889 Hatt and the children were over to spend the day and John came over to dinner. I worked on my quilt and began fixing my old wrapper. Will still working in the hay. Thursday July 25th 1889 I walked to town early this morning and Fanny took me out to her house where I stayed till about four oclock. I came down to Hatties. It looked so much like rain that I came on home soon after. I was sewing om my quilt. Will was haying today. Friday July 26th 1889 I finished my quilt, made Mothers white waist and done a little sewing for myself today. It rained so Will could not work in the hay so we went down the river after dinner and enjoyed black berries. Mother and Father were in town till after supper. Saturday July 27th 1889 I worked on my wrapper pretty steady till four oclock the berries came. I stopped them and helped put them up and baked a cake. After supper Will went to town and I worked on my wrapper. John is not well and Will and I were having a talk about him tonight. Sunday July 28th 1889 I was busy about the house most of the forenoon Soon after dinner Will and I went down to Stevens where we spent a pleasant afternoon and stayed till after supper. We stopped at Hatties on our way home I wrote some in the evening. Monday July 29th 1889 We washed this forenoon and I worked all the afternoon on my wrapper. Mother was in town in the afternoon weather cool and pleasnt. Maud had a little colt this evening.